Mobizapp Task2DO! Front End Framework Library PeckerPeck! - It's as dumb as it sounds! 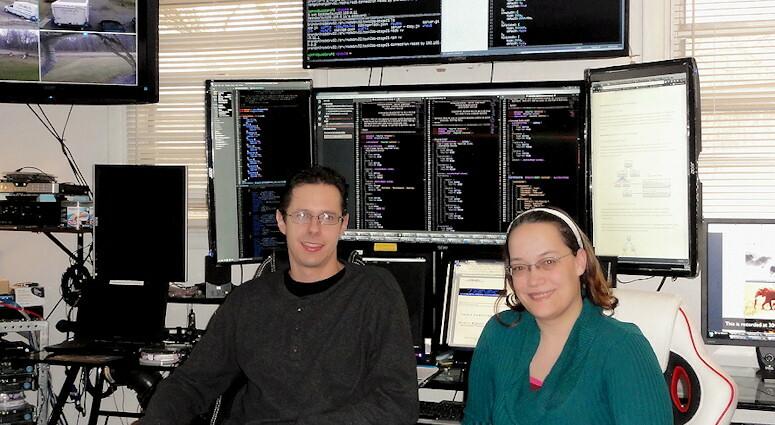 If you're wondering, yes we need that many monitors for development & testing. Brandon & Katie are are a husband & wife development team located in WNY. This site is currently under development. Please come back soon to check updates. 4-11-2018: Work is still being done on the website. Should be able to start uploading content withing the next day. Please check back soon. While talking to Katie one night about all the work that's required to develop, I jokingly said that it always seems to be the simplest apps games that end up going viral and making millions and I should just create a game where the only object is to tap the screen. No levels, no score, no enemies, no goals. You just tap the screen. That’s it. The idea is stupid, but my point was the situation that really applies to almost every industry. There’s always that one product that is so simple, but whatever function/feature it provides, it provides it in a way that can’t be beat. Boom! You could instantly move a 500lbs hutch across a carpet all by yourself. No waiting or relying on someone to help you move it & probably end up breaking your back & said hutch in the process. I’m sure everyone’s familiar with the feeling after seeing or using a product that is so simple but also the best at doing what it was designed todo. It also leaves you wondering: why didn’t I think of that? Maybe a wave of jealousy moves over you as you think about the millions the inventor/creator made and how their probably enjoying themselves on a private beach somewhere tropical. That’s how I feel anyway & I have a feeling I’m not alone. So I took a couple days and made a stupid game. Will it make millions? No, will it make dollars? Maybe. I made it as a proof of concept & also learned some graphical programming techniques in the process, so it’s already paid off. A word of warning: This game is vulgar. Is it professional? No. Should I have it on my website? Probably not. But I think everyone needs to laugh at themselves & how ridiculous society can be. If you don’t laugh playing it or reading the commentary below the game, then I will apologize your non-existent sense of humor. I won’t apologize for some of the vulgarity. It’s only used as a means of emphasis on certain things & not overused to the degree we hear every day anyways. Check it out here:PeckerPeck (yes, the name of the game is PeckerPeck) and have a laugh & good day. Notice: This Libary is currentley in development and should UNDER NO CIRCUMSTANCES be distributed or used until a production version becomes available. All rights reserved. No part of this publication may be reproduced, distributed, or transmitted in any form or by any means, including photocopying, recording, or other electronic or mechanical methods, without the prior written permission of the publisher, except in the case of brief quotations embodied in critical reviews and certain other noncommercial uses permitted by copyright law. For permission requests, write to the publisher, addressed “Attention: Digital Asset Permissions,” at the address below.